Earlier this month, the Qatari Deputy Prime Minister and Minister of State for Defence Affairs, HE Dr. Khalid bin Mohamed al-Attiyah, visited the Boeing Company factory at St. Louis, Missouri, to formally inaugurate the production of F-15QA Eagle multi-role fighters that have been ordered for the Qatar Emiri Air Force (QEAF). Although no initial delivery schedule has been announced, the 36 are due for delivery by 2022. Under the Ababeel project, the country has ordered 36 Eagles in a $6.2 billion U.S. Foreign Military Sales contract. Qatar received Congressional approval to acquire 72 aircraft, complete with support packages and weapons, and it is likely that additional orders will be made in the future. The Gulf state is also in the process of receiving Dassault Rafales from France and has ordered Eurofighter Typhoons from the United Kingdom. However, the latter deal has suffered a setback as Qatar has so far failed to meet the deadline for the first of a series of staged payments. Qatar’s F-15s are the most advanced version of the fighter yet developed. 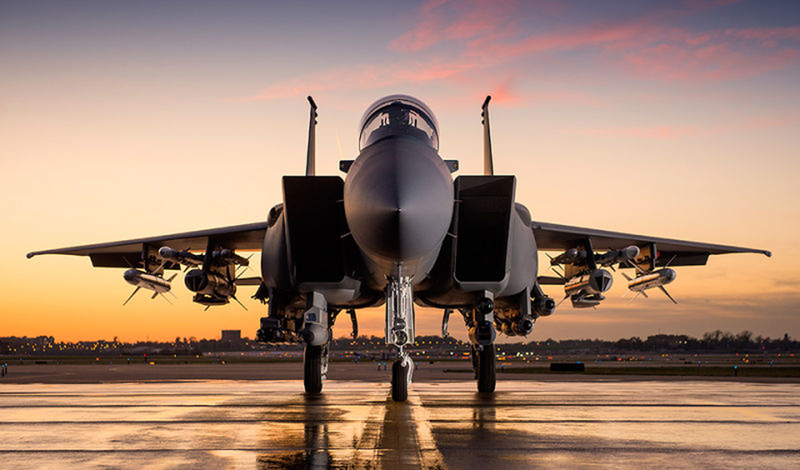 Based on the F-15SA that is being supplied to Saudi Arabia, the F-15QA (Qatari Advanced) has an infrared search and track sensor, a digital electronic warfare suite, and Raytheon’s APG-63(V)3 AESA radar. Unlike earlier F-15s, the new SA and QA versions have fly-by-wire flight control systems. Tests of the FBW Eagle got underway in early 2013. Moreover, Qatar’s aircraft will have a new wing design that retains the aerodynamic profile but has a new internal structure for longer life. New cockpit displays include a low-profile head-up display from BAE Systems. Most noteworthy is the adoption of a wide-area touchscreen display, similar to that found in the F-35 Lightning II. New launchers will allow Qatar’s aircraft to carry 16 AIM-120 AMRAAM missiles and four AIM-9X Sidewinders on air defense missions, with a range of precision-guided stores such as Small Diameter Bombs and JDAMs available for air-to-surface sorties. With first Saudi Arabian and now Qatari aircraft in production, the F-15 is enjoying something of a renaissance, thanks in many ways to the developments that Boeing has brought to the program in recent years, culminating in today’s F-15QA. Israel is considering acquiring another squadron’s worth of aircraft to complement the F-15C/Ds and F-15Is it has previously acquired. Elements of the F-15QA are included in a potential new version that could replace the U.S. Air Force’s incumbent Eagle fleet. Dubbed F-15X, the new variant would be a single-seater based on low-risk, low-cost development that draws heavily on work already performed for the F-15QA. Boeing had earlier pitched a partial-stealth Silent Eagle version for export with significantly reduced radar signature, but features of this variant are not likely to be included in the F-15X due to the lack of need for another stealthy fighter type to serve alongside the F-22 and F-35. Even if the F-15X does not go forward, some elements of the Advanced Eagle—such as the new wing—could be included in an upgrade program for existing U.S. Air Force aircraft.